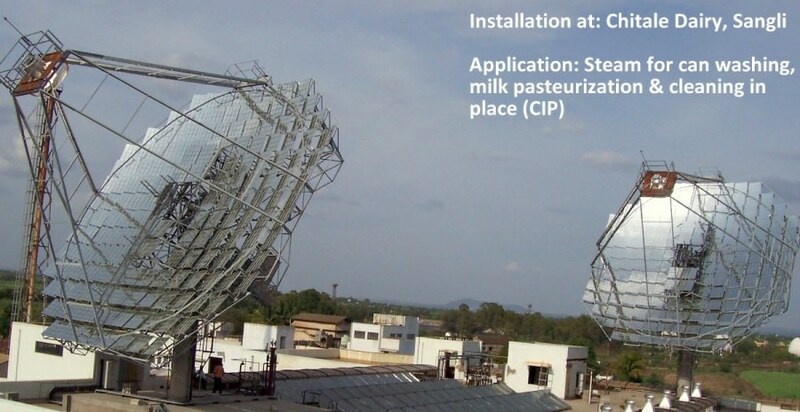 Clique Solar’s flagship product, the ARUN®160 solar concentrator dish, has been installed for various applications including steam generation for laundry, milk pasteurization, comfort cooling, automobile industry, cooking, amongst others. 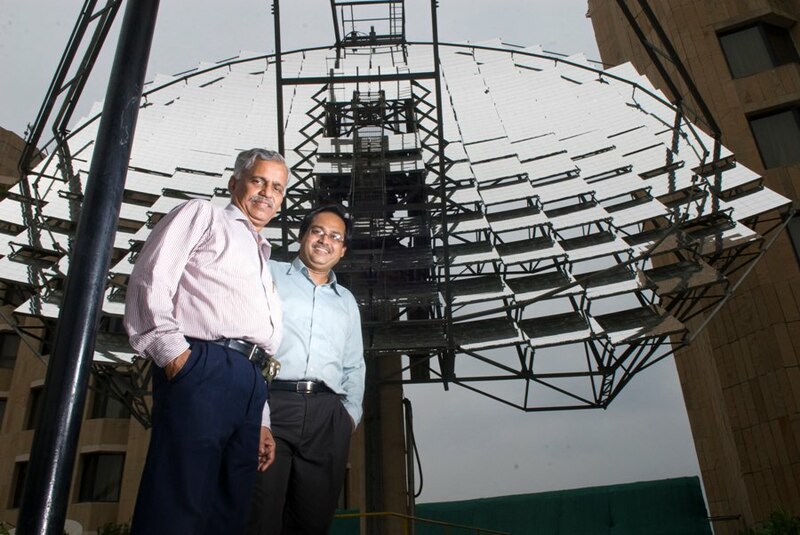 The oldest ARUN160 installation is operational since Jan 2006. 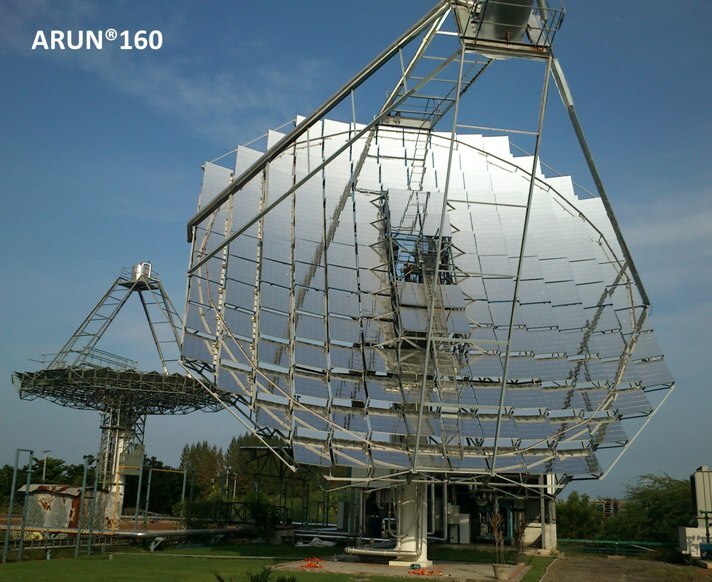 The ARUN® dish is a Fresnel paraboloid solar concentrator with a point focus. It can handle various heat transfer fluids including steam, hot oil, hot water or even hot air at temperatures up to 350°C and pressures up to 25 bar. The low area required for installation makes it ideal for industries with space constraints. 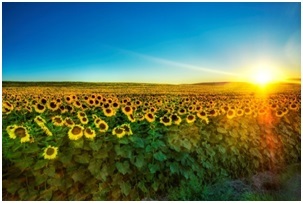 ARUN® technology is based on the basic principles behind a magnifying glass and a sunflower. 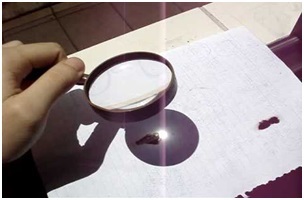 A magnifying glass concentrates sunlight at a single point with the help of parabolic lenses. Similarly, ARUN® uses an ingenious, fresnelized mirror arrangement scheme to get a 3-dimensional parabola effect. Like a sunflower, ARUN® automatically tracks the sun from sunrise to sunset on both East-West and North-South axes to intercept maximum sunlight throughout the year, irrespective of the installation location. ARUN® dish is mounted on a single column, thus occupying ground area of less than 3m x 3m. It can be operated in various thermic media including steam, water, hot oil, hot air etc and reach temperatures and pressures of up to 350°C or 25 bars respectively. The lifespan of an ARUN® dish is greater than 25 years. 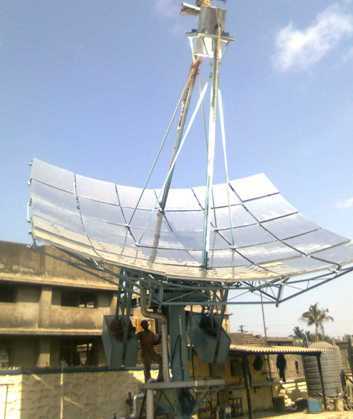 ARUN® is also India’s first IBR-approved solar boiler. Its dual-axis, completely automated tracking based on both, chronological tracking as well as light sensing tracking mechanism, ensures high tracking accuracy. Optics, receiver and integration scheme are the three most crucial components in any solar concentrator system. Optics of ARUN® is based on the Fresnel concept, allowing simplicity in structure, while maintaining maximum accuracy. The moving cavity-shaped receiver is designed to withstand high temperatures and minimize losses. Clique Solar is particularly skilled in integrating ARUN® with a variety of industrial processes ensuring very high efficiencies of 60-65%. The basic operation philosophy of an ARUN® steam generation system is very simple. 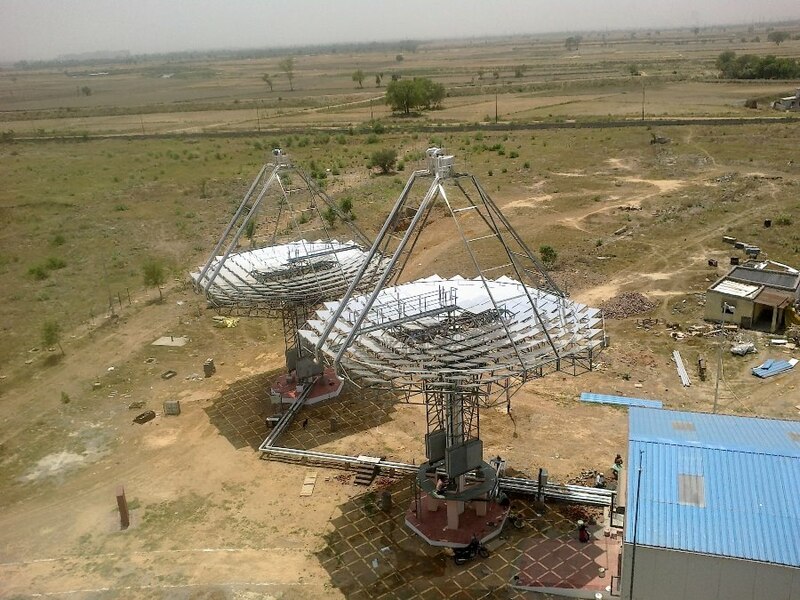 The receiver at the focus of the dish transfers the heat of solar radiation to a heat transfer medium such as water. Once the water is converted into steam, and desired pressure & temperature is achieved, the steam is delivered to the application area or the common boiler header. Currently there are 3 variants of the ARUN®-dish: ARUN®160, ARUN®100 and ARUN®30. The following table shows the technical specifications for ARUN®160. Small Footprint Area & Retrofits: The small footprint area of ARUN® dish enables it to be mounted at locations which have space limitations. It can also be erected on rooftops of existing buildings. Highest Efficiency: Due to the accuracy of tracking, cavity shaped high efficiency receiver which moves with the dish, and the accurate arrangement of high reflectivity solar grade mirrors, ARUN® dishes can achieve peak efficiency of 65% and annual average efficiency between 50-60%. Highest Temperature & Pressure Delivery: ARUN® can operate up to 350°C (oil) and 25 bar (steam). Non-Solar Hours Operations: ARUN® can be augmented with a heat energy storage facility for operation in non‐solar hours. IBR Approval: ARUN® is the first IBR approved Solar Boiler in India. 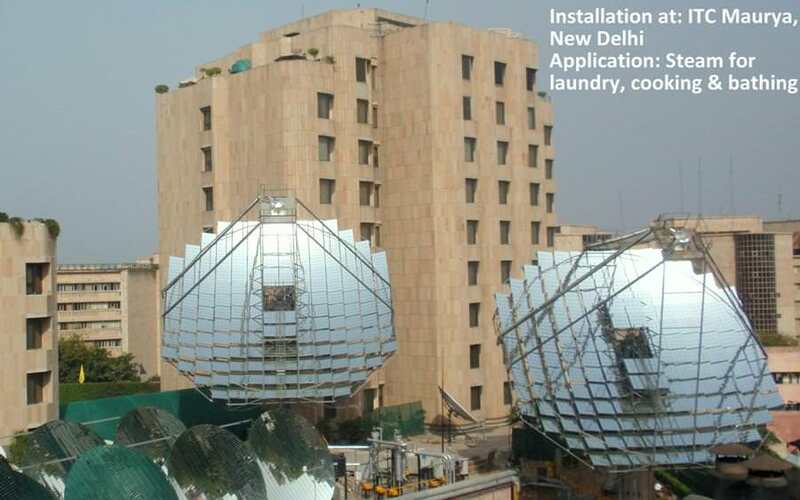 IBR Approval: ARUN® concentrated solar thermal (CST) system is the first IBR approved Solar Boiler in India. High Wind Bearing Capacity: ARUN® dish is designed to operate in wind speeds up to 10 m/s and it can survive in wind speeds up to 45 m/s. High Net Energy Gain: The Net Energy Gain (i.e. 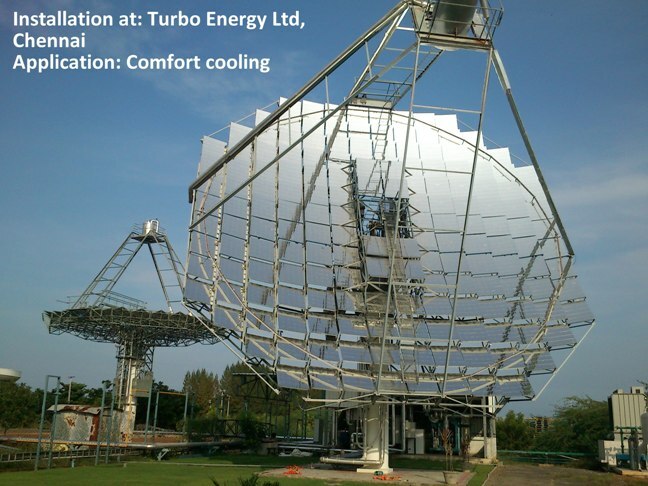 Energy gained from energy source – Energy expended in harvesting the energy source) of ARUN® solar thermal concentrator dish is amongst the highest in the solar for IPH manufacturing industry. High Wind Bearing Capacity: ARUN® is designed to operate in wind speeds up to 10 m/s and it can survive in wind speeds up to 47 m/s.